'Real Nightmare' Headed For New England; Blizzard On Track For Friday : The Two-Way If anything, already ominous-sounding forecasts are getting even more serious. By the the time it's all over this weekend, some parts of Massachusetts and surrounding states could have two feet of new snow on the ground. The National Weather Service's latest forecast of the snow totals across New England. Most places can expect 18-24 inches of new snow. It will start falling Friday and the storm is expected to last through Saturday. "A major winter storm is expected to impact the Northeast and New England Friday into Saturday. As much as one to two feet of snow is forecast from the New York City metro area to Maine, with localized heavier amounts possible. This, in addition to wind gusts as high as 60-75 mph will create significant impacts to transportation and power. Coastal flooding is also possible from Boston northward." The Weather Service has also now posted blizzard warnings for New York City, Connecticut and the Boston area. If anything, the already ominous-sounding storm we wrote about Wednesday is looking like it will bring even worse winter weather than expected to the Northeast and New England on Friday and over the weekend. 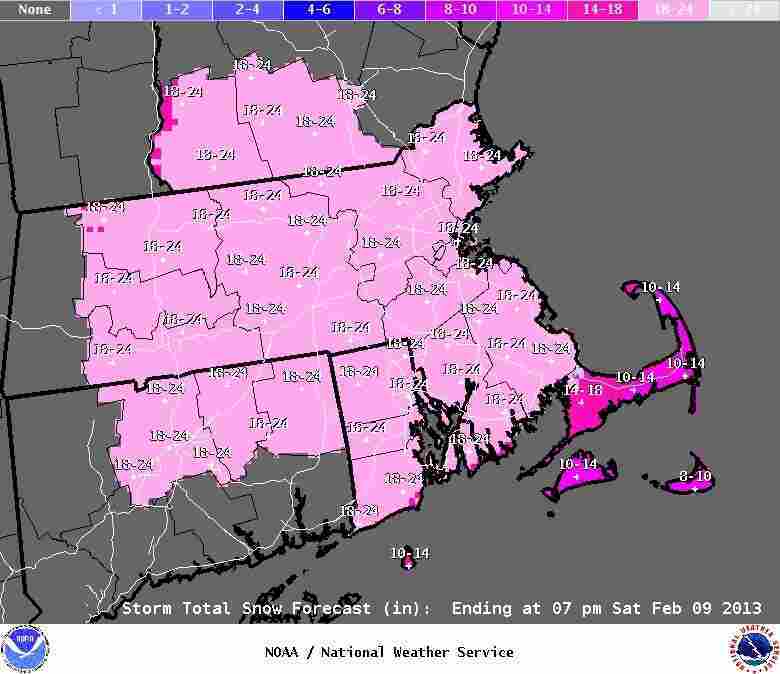 "Friday afternoon is gonna be a real nightmare," across much of Massachusetts and parts north of there, meteorologist Mark Rosenthal tells our friends at WBUR in Boston. "Snow's gonna be falling at a pretty good clip, the winds are gonna be picking up from the Northeast at 30 to 50 miles per hour, and the worst part of the storm, I believe, will be Friday night through much of Saturday." By the time it's all over, some places might have two feet of new snow on the ground. "Since you went to bed last night a few things have changed in the forecast, but if you were hoping the storm would go out to sea, that isn't going to happen. There is still conflicting information on the exact track of the storm. A wobble closer or further to the coast would ultimately change accumulations by big numbers, but it's still going to be a big storm." The National Weather Service says "forecasters are growing more confident that a major winter storm will impact parts of the Northeast and New England Friday into Saturday. This Nor'easter-type storm system will bring strong winds and heavy snow to the region. Eastern New England will see the greatest effects, and a Blizzard Watch has been issued for Boston and surrounding areas." "Only six times in Boston's weather history (more than 100 years) has more than 20 inches fallen in one storm. You truly need the atmosphere to set up just right for a blockbuster snow event. It seems that all the ingredients are in place at this point. "First we have an ample supply of cold air pouring out of Canada. ... Next, we have a very 'juicy' storm coming from the Deep South, out of the Gulf of Mexico with plenty of moisture to work with. And like so many other storms preceding it, as it reaches the warm current of the Gulf Stream of the Mid-Atlantic it will "bomb out" and become a very powerful nor'easter." As you'd expect, preparations are underway. The Boston Herald says "thousands of plows" have been put on notice. Local governments, schools and businesses are making plans to possibly close down.